I had heard that House of Fraser were having a launch night for the new make up line Wild About Beauty, Now I don't need to be told twice if there is a make up event... I'm there!! I was really looking forward to going and seeing this new beauty range and finding a bit more about the products. It is a core collection made up with beauty products that is paraben free, easy to use make up essentials. The products are very wearable shades that are meant to help enhance women's natural beauty. The make up line is co-founded by Make up Artist Kim Jacob and Louise Redknapp. They have known each other for over 7 years and together have created 'Wild about Beauty'. After having children Louise developed skin pigmentation and Kim's style of make up help Louise regain confidence of a natural look with out it being heavy or complicated make up. The colour range is more on the natural side but still provides you with some colour like a gorgeous purple shade (Heather) and a dark green black (Jody) to give you that darker smokey evening look. The creme eyeshadow's stood out as a favourite for me as the colours are gorgeous and would make a lovely base or all over lid colour for everyday. I got a creme shadow in the colour Edna, it is a stunning shimmery golden brown. I think this will become my everyday go too shadow!! Another piece of the collection that stood out were their Eyeshadow Pencil Duo and the Lip pencil Duo. I think these are great for your make up and handbags! Definitely a must have for anyone who love combination products and like to have things easy to use on the go. Another thing that I really love about this new make up range is the packaging! For me it is a definite winner as anyone who knows me, knows how much I adore anything purple! And to top it of the extremely pretty detail of the dragon fly and bug that that are embossed onto the products. I think the price range isn't overly expensive to other high end brands and I would happily pay the price for such good quality products. I will definitely be trying more products from this range as I really liked the look of the skincare, in particular the Botanical skin prep. I love the fact that there products are paraben free as well as them using nourishing and beneficial ingredients in there products. I think this brand will appeal to everyone as it is more natural products but without being boring! They have the colours as well as the naturals that you would want, and as they say on their website they've made it so it isn't over complicated! I would definitely recommend going down and having a look at this range. It is available at the House of Fraser in Belfast. You can find your nearest stock list here. 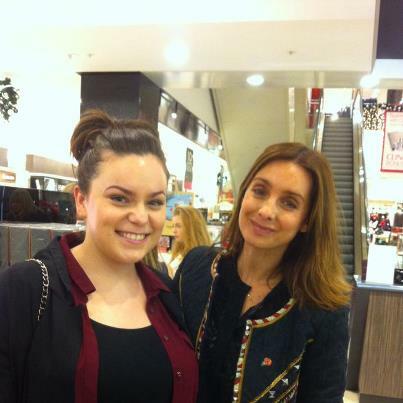 It was really nice getting the opportunity to meet Louise Redknapp. She was really lovely and took the time to get photographs with the people that turned up to see the make up line. Check out there website Here!! You can also find the House of Fraser link to there page for Wild About Beauty Here! Ah you lucky duck! I couldnt get out of work in time :-( Products look awesome, must pop in!